German citizens have participated in the bloody expulsion of Christian villages in Syria, according to the German newsmagazine Focus. The incident is part of a larger problem involving German and other citizens from Western countries joining jihadist groups in Syria's brutal, multiparty civil war, raising Muslim terrorism concerns in Syria and beyond. A radical Muslim militia conducted an "ethnic cleansing" of Syrian Christian villagers near the border with Turkey on Aug. 6. According to the Focus report, two unnamed Western intelligence services identified German Muslim converts and other Germans with an "immigration background" as militia members. A recent propaganda video shows jihadists speaking in German praising the expulsions, during which several murders occurred. The video also shows jihadists desecrating the bodies of Syrian soldiers with kicks to the head. About 70 German Muslim militants have traveled to Syria according to a July report from Germany's Office of Constitutional Protection (Verfassungsschutz), an extremist monitoring agency. Notable among them is the German-Ghanaian rapper-turned hardline Muslim convert Denis Mamadou Cuspert (aka "Deso Dogg"). Once known for his gangster lyrics and tattoos, Cuspert now produces German-language jihadist nasheeds, or Islamic devotional music, Turkish-Moroccan-German journalist Souad Mekhennet reported in the Daily Beast. One such online video emailed to Mekhennet on July 30 shows images of suicide and Improvised Explosive Device (IED) bombings and repeats the refrain, "I want death and cannot wait for it, armed with bombs and shells." Western intelligence services believe that Cuspert is fighting with the al-Qaida linked Al-Nusra Front under his nom de guerre Abu Talha al Almani (Abu Talha the German). Indeed, an online video purports to show Cuspert in Syria. There, he is one of an estimated 6,000 foreign fighters, about 10 percent of whom come from Australia, Europe, and North America, Mekhennet reported. Some of these cases can be surprising, as the Syrian-German Lamya Kaddor, chairperson of the Liberal-Islamic Union (Liberal-Islamischen Bund), discovered. A school teacher, Kaddor was involved in a pilot project to teach Islamic studies in North Rhine-Westphalia provincial schools. In May, she discovered that five of her former students, four of them brothers aged 18 to the mid-20s, had traveled to Syria as jihadists. Kaddor remembered the young men as having girlfriends, going to parties, and drinking alcohol. A student might call non-Muslims in class "kuffar," causing someone to think "spontaneously" of a "fundamentalist outlook," she said. Yet some students would "simply blather such things without reflecting because they considered it cool and, above all, because the social circle cannot deny them being Muslim as an identity factor." Worrisome is not only what these jihadists could do in Syria, but what they might do after coming back to their countries of citizenship. "The experiences of the past years in jihad areas such as Afghanistan, Iraq, Pakistan, or Somalia show" that "the war of Islamist extremists is no one-way street," wrote Florian Flade, a reporter for Germany's conservative Die Welt newspaper. Similarly, security authorities see Syria "developing into a growing training camp for jihadists from the West," Flade and her colleague Martin Lutz noted in another Die Welt article. 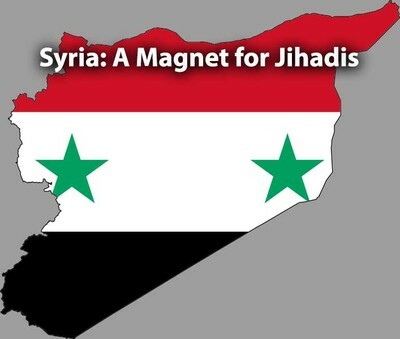 "Jihad tourism" the Frankfurter Allgemeine Zeitung (FAZ) newspaper calls the phenomenon, something Syria's proximity to Europe makes easier than earlier battle fronts. Syrian jihadi veterans returning to Europe after learning their "deadly handwork" would be "ticking time bombs," Germany's Federal Minister of the Interior Hans-Peter Friedrich feared in a June 7 FAZ interview. Verfassungsschutz President Hans-Georg Maaßen worried about 20 German jihadists who had returned to Germany in a June 24 interview. Such individuals would appear in Germany's militant Muslim "scene" as "heroes" and would be "emotionally pumped up" to engage in terrorism or its incitement. "In the worst case they are coming back with a direct fighting mission," Maaßen said. In all, the greatest danger to German democracy came "definitively from Islamists." Jihadists in Germany and elsewhere also knew how to exploit humanitarian concerns for Syria's war-plagued population as a source of unwitting support, Hamburg's provincial branch of the Verfasssungsschutz reported. The German government prohibited some organizations from collecting money for "relief" purposes in Syria for fear it would go to supporters of terrorism. "Whoever wants to perform humanitarian help," the Hamburg Verfassungsschutz cautioned, "should inform themselves about the offers of more established and serious help organizations." Questions about arms camouflaged as aid arose in the case of used ambulances purchased by a mosque in Neuss near Düsseldorf headed by Sven Lau, a German Muslim convert who has traveled to Syria. Both Lau and the mosque are under Verfassungsschutz observation due to their radical Islamic convictions. Press reports cited a YouTube video posted July 27 showing the delivery of two these ambulances to a Syrian hospital, yet suspicion remains. Ambulances have functioned in suicide bombings, offering a ruse de guerre with their benign character. Germans jihadists like Lau are comparatively few in number compared to jihadists from other European countries, as the International Centre for the Study of Radicalisation (ICRS) in London showed. ICRS's April assessment found that smaller European countries accounted for considerably more Syrian fighters than Germany. While as many as 40 Germans are believed to have joined the jihad, ICRS cited dozens more from France, the United Kingdom, Belgium, the Netherlands and Denmark. These other European jihadists exhibit the same traits as their German counterparts. One British Muslim convert of four years, for instance, went to Syria with her husband, born Muslim in Sweden and betrothed to his wife in a marriage arranged by his mother. The woman enjoyed watching soccer on television and having studied psychology and sociology in college. While her husband fights, the pregnant wife concentrates on household chores and takes care of their daughter. She says that she will not return to the United Kingdom, even if her husband is killed. In February, Ibrahim al-Mazwagi became the first British jihadist to die in Syria. Before his death, he told Channel 4 that back home he had a job, a car, and a university education. "We weren't struggling, we were just normal," he described himself and his family. In Syria, Mazwagi fought under the black flag of jihad used by groups like al-Qaida and his own Katiba al-Muhajireen (migrants' battalion), whose foreign fighters included the Canadian convert Abu Muslim and a Swedish Muslim. "Our religion is one of superiority and honor," Mazwagi told Channel 4. "We can't accept enemies of Allah for our religion—killing us, abusing our religion, belittling it, taking our lands." He is not the only foreign fighter to die in Syria. Three, possibly four, Belgian jihadists were dead by June. The latest casualty, 20-year old Tarek Taketloune from Brussels, died from a shot to the head while he was sleeping, possibly because he had angered his comrades with a desire to return home. Taketloune served with about 30 Belgians in a katiba organized by the Belgian Islamist group Sharia4Belgium, disbanded since last October. Belgian police recorded in December 2012 the commander of the katiba, 22-year-old Hussein Elouassaki, bragging about cutting a Syrian soldier's throat. A May 11 Le Monde story describes the varied backgrounds of four Belgian jihadists. Two were Muslim converts, one of whom had struggled with unemployment. Two brothers from an Arabic background, meanwhile, showed scholastic promise, the younger in high school and the elder while studying mechanical engineering in college. Given that it is proportionately the "number one" provider of European jihadists to Syria, according to Dutch terrorism expert Edwin Bakker, Belgium has responded by forming a Task Force in March to coordinate police and intelligence efforts against jihadist recruitment. The Flemish cities of Antwerp and Vilvoorde also began last month to end welfare payments to Belgian jihadists. European involvement in Syria offers a case study in the increasingly well-known phenomenon of "jihadists next door." A Western environment alone seems to offer no ultimate protection against the seductive call to jihad among native-born converts and diaspora immigrants. As Kaddor's students and Cuspert among dozens of others demonstrate, Islam seems to have a unique ability to draw ordinary individuals into extraordinary fanaticism. Whether in Muslim-majority or Muslim-minority countries, the battle for hearts and minds against jihad ideology demands to be fought and won. When they have finished the Jihad in Muslim countries they will continue here in the West. The only way to tackle the problem is to stop Muslim immigration to Western countries and send back those already here.